* Available in sizes 10, 11, 12 (UK sizes T, V, X). 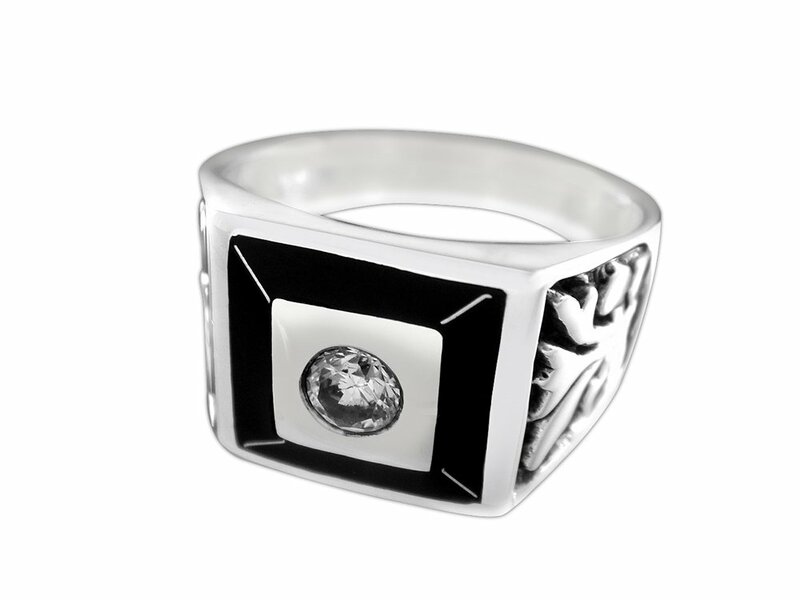 * The ring features a round clear Cubic Zirconia stone in the center approx. 3/16" (4.5mm) in diameter. * Ring's front height of 9/16" (14mm) tapers off to 3/16" (4.5mm) at the back. * Engraved Celtic symbols on both sides of the ring. We accept payment by Paypal only. Please specify finger ring size during check-out. We ship worldwide. All items are shipped with registration by Thai Air Mail. Delivery time varies and is dependent on the destination country and the Thai postal service. Please allow approximately 2 weeks for most countries. Items are shipped usually within one day once payment is received. We ship on all days of the week (Monday-Sunday). We happily combine shipping for multiple items. Please contact us if you wish to combine shipping and save money on the postage rates. We always try to take advantage of the best possible mailing rates. We can also accommodate special orders. Please do not hesitate to contact us if you have any particular question. Thank you for your visit and we sincerely hope to see you soon again. For any queries please contact us at thaijewel73@gmail.com.